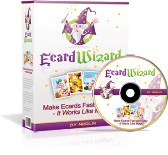 Make Halloween cards for friends and family with this homemade greeting card idea. 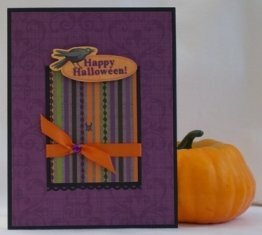 For paper card making ideas, use bats, ghosts and pumpkins on cards for Halloween. 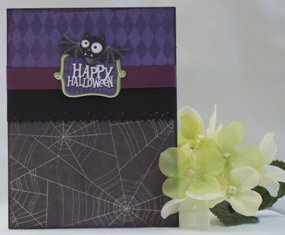 I used a paper stack for making handmade Halloween cards. I love paper stacks because they coordinate all the colors and prints for you. 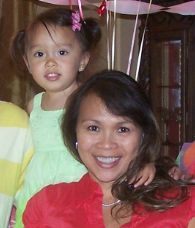 For this Halloween card craft, I chose a busy print and another not--so-busy print that coordinated. I separated the print with a solid orange and bordered the solid orange with black. What's great about this print is that you can coordinate it with lots of colors and use pumpkins, ghosts or bats for your embellishments. Halloween card designs can come in so many varieties and I used a sketch from an ebook I purchased and it's called 50 Card Making Sketches. I altered the sketch a bit but it gave me the foundation to make a Halloween card. The sketch didn't have ribbon or stickers but I like to include embellishments for many of my handmade card ideas. 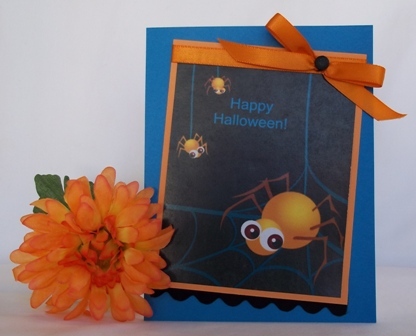 With Homemade Halloween cards, you can use any embellishment you want. Since my paper print is so busy, I didn't use that many accents for handmade cardmaking project. I placed an orange, satin bow over the sentiment and added a dimensional bat sticker. The bat sticker also coordinated with the paper print. For my Halloween card ideas, I used small clear labels to print my sentiment on. After printing the sentiment on my laser printer, I adhere the sticker and then added a couple of orange, adhesive gems under it. 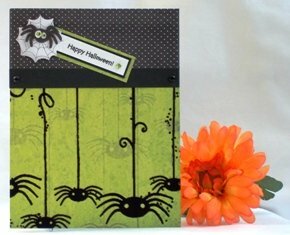 I like to use chalk ink along the borders when making Halloween cards and I used black ink around this card. Homemade Halloween card ideas can come in so many layouts and sketches help to build your own Halloween cards.